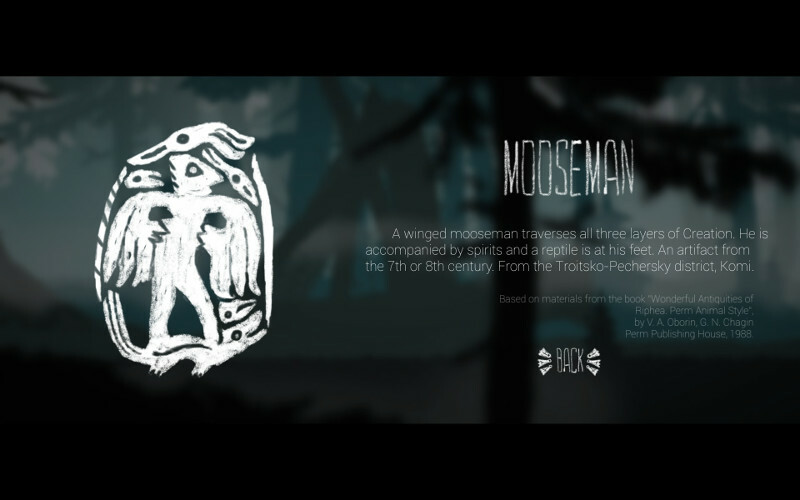 In 2017, a game called The Mooseman (Vladimir Beletsky, Mikhail Shvachko, 2017) was released on Steam. For me, the peculiar thing is that it is based on Finno-Ugric mythology, of which Finnish mythology is but a small piece. Given that I'm a Finn and I've read a few chapters of two books that talk about the mythology in Finland and related people around the Baltic Sea... well, I'm still not qualified to evaluate how the mythology was adapted into a game. It doesn't help the game is based on stories of people that don't include the Finns either. If only you knew how much I've struggled to try to get the terminology correct even in the previous paragraph... But I'm less unqualified than most on this site, I'd wager, if only barely. So ideally, this blog would've been written by someone more aware of the people and mythology in question, but I hope I'm still having a positive effect here without insulting anyone. Uralic languages (a superset that includes Finno-Ugric languages) are spoken by about 25 million people altogether in the world. Of the Uralic languages, Hungarian has the oldest written language, the oldest text in the language apparently from 10th century. Finnish and Estonian got their written languages only in the reform movement in the 1500s. And Komi-Zyrian language, whose stories are the foundation for Mooseman? From what I can gather, 1300s. The importance of the written language is that until that was available and even later, the lore was passed between generations as oral tradition. That's one reason the stories between different people can also be different. Other reasons include elements taken from other faiths, such as various branches of Christianity. To be more exact, the game says the stories used as influences are from Komi peoples, Sami and Mansi. Their languages are different enough to Finnish that I don't think there's much of a chance of me understanding a Komi sentence. 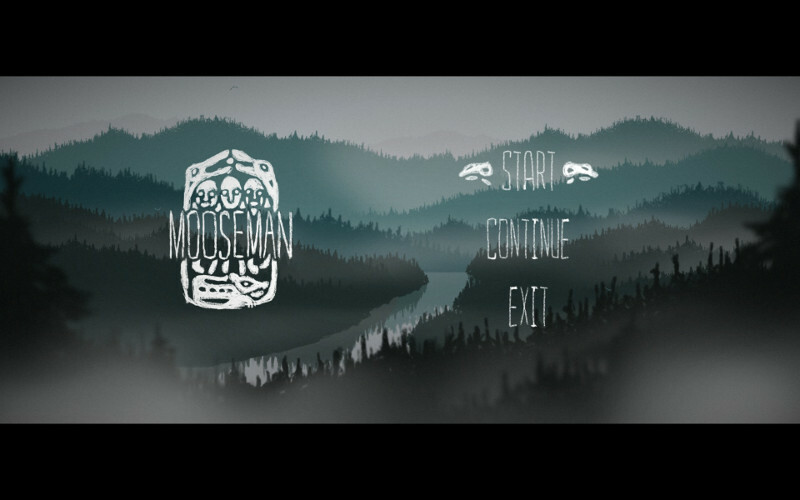 So, with that disclaimer in mind... what did I think of Mooseman and what did playing it make me think? "Regular vision" from the start of the game; you're the one with the circle on top of the staff and you can't talk with the other people. The Mooseman is a very linear puzzle game with maybe three to five action-style scenes that require quicker movement than the rest of the game. The premise is that you are the Mooseman and you'll go through all three worlds (layers of Creation) -- the middle world, the lower world (underworld) and the upper world in the sky in this story. I could compare how The Mooseman plays to Cat Lady (Harvester Games, 2012), but far simpler. All of the game is viewed from the side. The game uses four keys - left, right, switch vision between the mundane and the spiritual, and eventually, one to use a specific item. No jumping, no running. The switch between the two vision modes is what lets the player choose which path to move on: some buttons can be pressed in only one mode and some objects can be walked on only in another mode. So, to press three buttons in a specific order... you walk in one plane to the button, then switch to another plane so that you can press the button by standing on it, then walk to another button, switching the world if necessary to avoid pressing another button on the way. If this sounds clumsy, that's because it is and even if I explained better, it would still be clumsy. 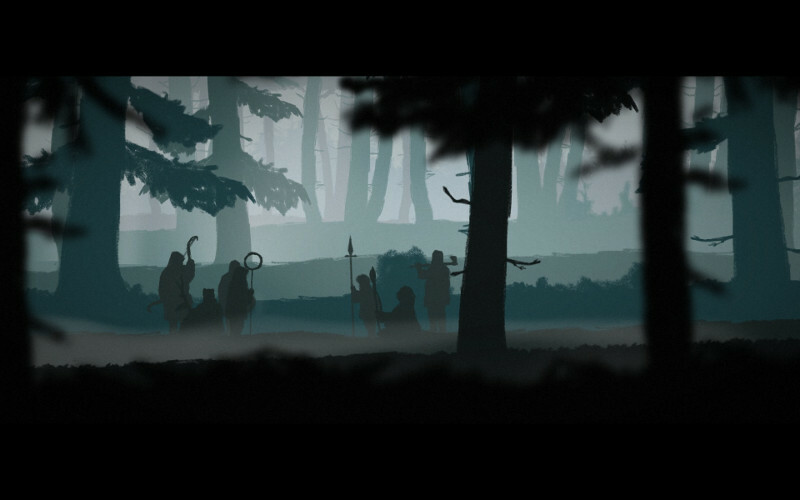 Spirit view in the opening part of the game. To finish the game, you don't really need to read any of the lore. The puzzles aren't taxing: given the limited the number of actions the player can do, the biggest problem is typically in figuring out in which order to press buttons. Even that is usually very straightforward and can be picked up from various visual cues. Still, the game is short: only an hour and a half with me trying to find more secrets. If you want to 100% complete the game, this is where it gets tougher. The world has several artifacts hidden here and there, sometimes hidden behind an optional puzzle. A few of them are in "obvious" locations, but not all. The visuals are downstated. 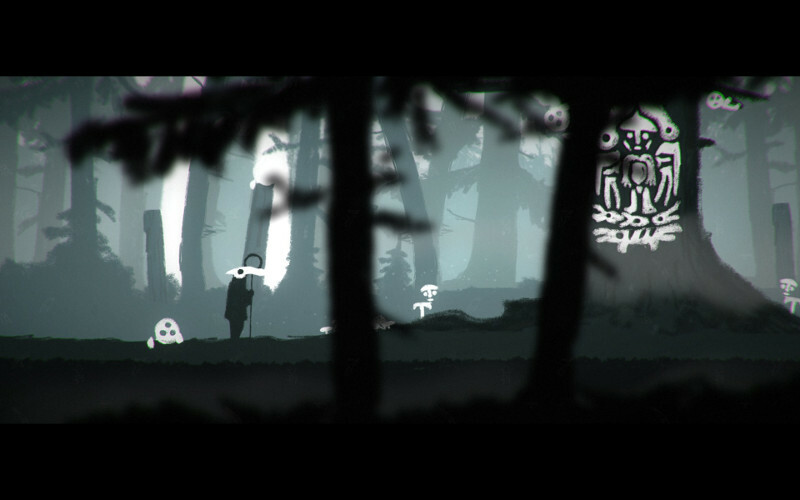 The game is in 2D, but the game uses multiple layers with parallax scrolling to create depth. 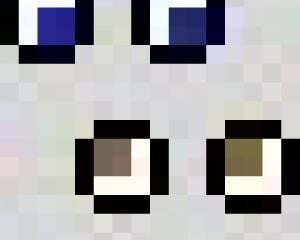 The layers themselves are effectively monochromatic, with the exception of the spirits that are still mostly white. The hand-drawn style where spruce branches clearly show individual brush strokes works well. 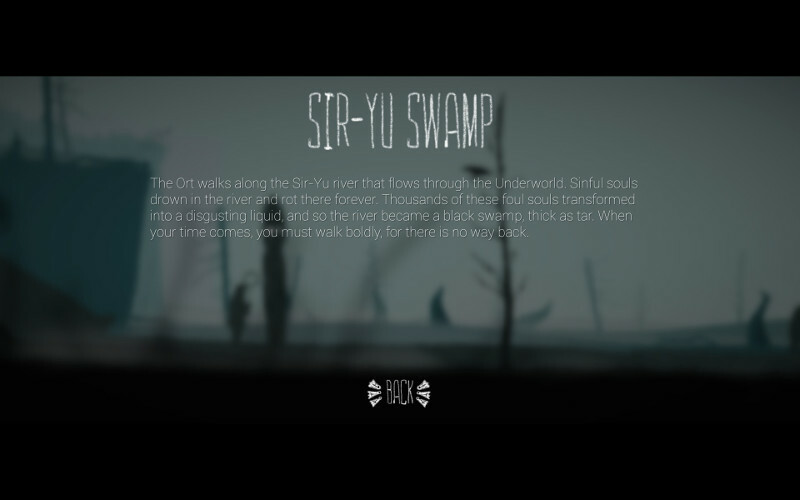 The overall theme is, as you can see in the screenshots, down-to-earth but more than just grayscale like Limbo. Most of the rotoscoped animation isn't very smooth, though. There are similarities in the game's lore to what I've read in the Uralic mythologies in the Baltic sea region, but by far more is what I don't know. The default assumption to use here would be that I'm wrong in what I'm saying... which is why I'm not saying much. The risk of me mistaking a coincidence for evidence is just too high. I mean, while Osh is a bear in the game, one of the many Finnish names for a bear is "otso" or "ohto". They sound similar, but do these words have the same origin? For one, though, Sir-Yu river separates the middle world and the lower world. It's a fair comparison to Styx, Acheron or Tuonen joki (the Finnish analogue). Example of how the characters and locations are explained to the player. These texts are unlocked as the game progresses, but the player has to open a menu to read them. The forest theme was appropriately very prevalent in the middle level of the world. There was one 'perfect' match: the Milky Way in the sky is the pathway of the birds, the path they use to migrate. The Finnish name for the Milky Way, "Linnunrata", is a matching translation. The game includes pieces of mythos in text (and on occasion also in voiceovers), as seen in the above screenshot. This is essential in having an understanding of what goes on in the game, as the visual language itself isn't enough. The first artefact you can find (I think). These do not affect the gameplay. Eurogamer had a review of Never Alone (Upper One Games/E-Line Media, 2014) by an American Indian where the reviewer said how he was moved by that game. I am too distanced from both any Uralic mythology and the Komi, the Sami and the Mansi people for this game to have a comparable effect on me. That said, I would be lying if it weren't interesting to see something that is as mundane as a pike to take an otherworldly quality the way it does here. Even though the pike is featured also in the Kalevala, the difference comes in playing the game as opposed to just watching a painting or reading a poem. This is not a long game and it costs 7€ at the moment. When it comes to technological prowess, it isn't impressive, but I do like the art style that leaves enough for the imagination. The puzzles in the game shift it a half-step away from being a pure walking sim or a "virtual installation", but only barely. And in a sense, with the collectible artefacts and pieces of lore, this really is a virtual installation of sorts. While I'm happy with the purchase, I imagine many would be turned off by it for the very same reasons.